Tofu is a plant-based food made from soybeans that’s a good source of protein, iron and calcium. Pair this recipe with a favorite vegetable for a protein-rich, vegetarian lunch or dinner. *For a gluten-free alternative, substitute soy sauce with liquid amino acids. In a small bowl, combine ginger, soy sauce, paprika, turmeric and black pepper. Set aside. Heat a medium skillet until hot. Add sesame oil and garlic and stir over medium heat until fragrant. Add diced tofu. Pour sauce mixture over tofu and stir well. Continue stirring and turning tofu until all sides are cooked to golden brown. Nutritional information (per 4-ounce serving): Calories 100, Fat 6g, Saturated fat 1g, Carbohydrate 4g, Sodium 73mg, Protein 9g. 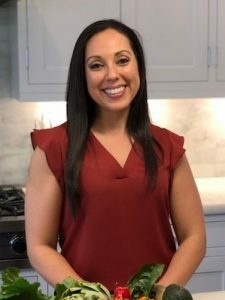 Natalie Castro is a registered dietitian and the nutrition and wellness manager at Baptist Health South Florida, where she oversees the food and nutrition policy for the organization. Natalie earned a bachelor’s degree in nutrition and dietetics from Florida International University and a master’s degree in nutrition and exercise science from State University of New York at Buffalo (University of Buffalo). She believes a food environment supported by healthy choices fosters healthier lifestyle habits. Natalie is certified in adult weight management by the Academy of Nutrition and Dietetics, and her research is published in several peer reviewed medical journals.